‘Tis the season for zucchini: if you have a garden of your own or rely on a CSA basket for your vegetables, you’re probably wondering what on earth you can do with the sudden explosion of summer squash. It’s not just the zucchini, either: summer squash comes in all shapes and sizes including yellow squash (the ones that look like yellow zucchini), crookneck squash (also yellow, and covered with little raised bumps), and patty pan squash (the tiny kind that fit in the palm of your hand). Just take a stroll around the farmers’ market and you’ll see the incredible variation on display. You can use any kind of summer squash, or any combination of varieties, for this recipe. I put in both yellow and green, for a nice visual effect. The lighter flavor of summer squash can seem boring if you don’t know how to cook it properly, but try thinking of it as an opportunity instead: this is your chance to play around with bold seasonings, spices, and flavors without overwhelming the dish. 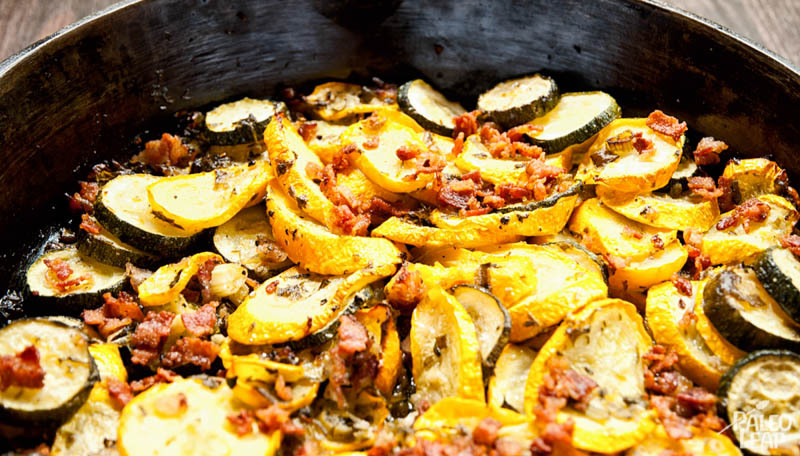 Here, the rich smokiness of bacon and the sharp tang of the capers would be overwhelming with a strong-flavored vegetable, but combined with the gentle sweetness of the summer squash, the bold seasonings create a delicious overall effect. This dish would be a great addition to any barbecue dinner, but also consider it for breakfast – the bacon adds a more traditional “breakfast” flavor, and it’s a perfect way to add some vegetables to the very start of your day. If you’re in the middle of this month’s Whole30, and struggling to get your vegetables in with Meal 1, try it out with some compliant bacon for a fresh alternative to the usual sauteed spinach – yum! 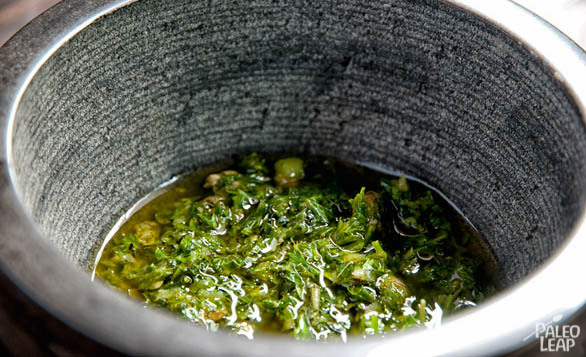 Using a mortar and pestle or a food processor, grind the oregano, the mint, and the parsley, and transfer to a bowl. Grind the capers and the garlic. Add them to the herb mixture, and stir in the olive oil, lemon juice and season with salt and pepper to taste. In a big bowl, mix in the squash, the green onions, the bacon bits, and the fresh herb sauce. Empty the bowl into a baking dish or a big skillet and bake 35 to 40 minutes, or until the squash and the bacon bits are nicely cooked.